Eastern Montana and the surrounding region was home to many of the Founding Fathers of the American Highland Cattle Association. I'm proud to be playing a small role in preserving this wonderful, heritage breed and carrying out the mission of our Highland Forefathers! My cows are adapted to the extreme climate of the Northern Great Plains region. They thrive on the irrigated grasses and forbs on my small farm during the grazing season and local grass hay over the long winters. You can now find "Gumbo" blood in many of the surrounding states and beyond. I've sold registered, commercial purebred, and Highland/Longhorn cross stock out of three main sires: MacBeth of Cherry Point, Tramp's Solus, and recently, Prairie Thunder. These bulls are descended from some prominent Canadian sires. 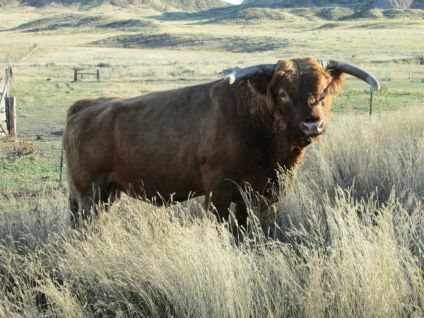 My current sire is KHH Brody from Western Montana. Currently most of my sales are grass finished beef but occasionally I have purebred Highland breeding stock available. I currently have one New Year's eve born bull calf out of KHH Brody and BET Sicily. Check out the "2017 Calves" link and watch for new pics of this guy. Two purebred brindle heifer calves were born in March and May. These were out of KHH Brody, BET Rona, and BET Senga. The last two steers of 2018 are currently aging at our local USDA butcher here in Miles City. These steers have never seen grain and at 2.5 years old have hanging weights of 723# and 664#. One and a half have not been spoken for. Call to get your. Ground Beef. I have some surplus frozen ground in 1# packages still available at $4/#. This is from the last two steers which were 2.5 years old and grass finished. If you're looking for skulls, I have a small selection of Highland skulls available. I have 3 purebred calves, 2 heifers, one bull. The bull and one heifer are now weaned. See the recent pics of my "2018 Calves". Selling lean, grass finished ground beef by the package now. Check out my new Beef Page now! Call for more information or to arrange a tour of my farm. My Main 2015 Sire: Prairie Thunder at 11. Brody has 2017 born calves for reservation. From March 14-May 14, 6-Brody sired calves were born.